That low whistle tone you hear ringing through the valley in Pittsburgh may not be your typical locomotive hauling Coca-Cola from the Clairton works. It may very well be the sound of the (Ian) Cole Train leaning the station of PPG Paints Arena. He doesn't seem particularly thrilled about it either. After all, he has made it well known that he loves it here in Pittsburgh. We have all been scratching our heads (again) as to why Ian Cole, an integral part of the Penguins' Stanley cup winning success, has been a healthy scratch the past three games. When The Athletic's Josh Yohe asked how he felt about it, Cole, who is usually open about his feelings when it comes to the team, was just a bit tight lipped and seemed a little downright snippy. "Not playing hockey doesn't sit very well. I don't think that's unique to me. that's pretty standard for every hockey player. I don't have a ton to say about it. you can kind of infer what you want. I'm not going to say a ton about it." There really isn't too much to infer. Cole is low-key ticked, having been a big part of the teams back-to-back championship runs, and, his love of the city and it's fans, one can understand why. On Monday November 27, while the Penguins were gearing up to take on the Philadelphia Flyers, it became clear, to much dismay, that the Penguins are actively trying to trade Cole while they can still get value for him. Cole is an unrestricted free agent at the end of the season, and is currently making $2.1 million. 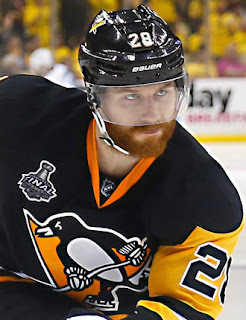 However, his solid play, ability to effectively kill penalties, and his no-fear attitude when it comes to blocking shots and throwing a hard check leads one to believe that a hearty raise would need to be swung his way in order to keep him in Pittsburgh. It seems the Penguins aren't willing to negotiate such a steep hike in pay having extended Brian Dumoulin's contract and signed Matt Hunwick to a three year deal, and would rather allow Cole to venture elsewhere. Where he will end up is the question. Per Jason Mackey of the Pittsburgh Post-Gazette, Cole will not likely be dealt to a Metro division team. Mackey cites the three teams most heavily showing interest at this point as Vegas, Colorado, and Toronto. This opens the door to a lot of speculation as to whom the Penguins could acquire. The name being thrown around the most, and even before the season began, is that of Toronto's Tyler Bozak. Bozak currently has four goals and seven assists on the year. He carries a cap hit of just over four million dollars. He also has experience playing with current Penguins forward, Phil Kessel. Bozak could be the boost at center the Penguins have been looking for. That potential trade, however, would leave a two million dollar gap needing made up for. Penguins management would have to get creative in what else is offered. Although he also becomes a UFA at the end of this season, Bozak also carries a modified no-trade clause so whether or not the Penguins are even an option for him to waive that NTC is anyone guess. The elephant in the (locker) room still remains: why? Why Cole? I mentioned last week that there seemed to be something off within the team somewhere. There was something not right going on with the team chemistry that was reflecting on the ice. We have now learned that the relationship between Head Coach Mike Sullivan and Ian Cole has become very much strained for various reasons. That tension between a well-liked player and the head coach can trickle down within the whole team which could have been one of the reasons for Cole being scratched for three games straight. If you also factor in the addition of Matt Hunwick (who plays a similar style sans the heavy checking) and the success of Chad Ruhwedel, it seemed that the Penguins felt the choice to look into a possible trade made sense. With three days off between games the announcement of a trade seems imminent and could come at anytime. Keep your eyes peeled to the various outlets (and make sure to check for spelling in their Twitter handles) and prepare your hearts for the announcement that will come sooner than even Cole would have liked. I would love to hear your thoughts. Is trading Cole a good move? Who would you like to see in return, and, why should the Pens make a move? Ring in with your answers via our social media platforms on Twitter and on Facebook. Be civil, please.